Millennials. Cultural icons. Digital natives. Everyone can access the world wide web. Jumbotron images with a carousel? Use Responsive Images One image may not be enough. CSS Grid Layout, 2017 CSS Grid Layout will transform the way you design and develop for the web– and Rachel Andrew will change the way you understand the spec. Accessibility, performance and aesthetics inform my design practice and I’d like to share my thinking for you to keep in mind as you make your own sites. Design is about solving problems creatively and technically. Art direction guides design to generate emotion for editorial goals. One of my goals as a designer and developer is to make sure people of all ages, abilities or places in the world can engage with compelling content. I design sites to be easy to use and to load fast no matter how or where you connect. That doesn't mean sites don't need to look good. In this salon, I'll share a few stories about my experience building sites based on my ethics and principles. 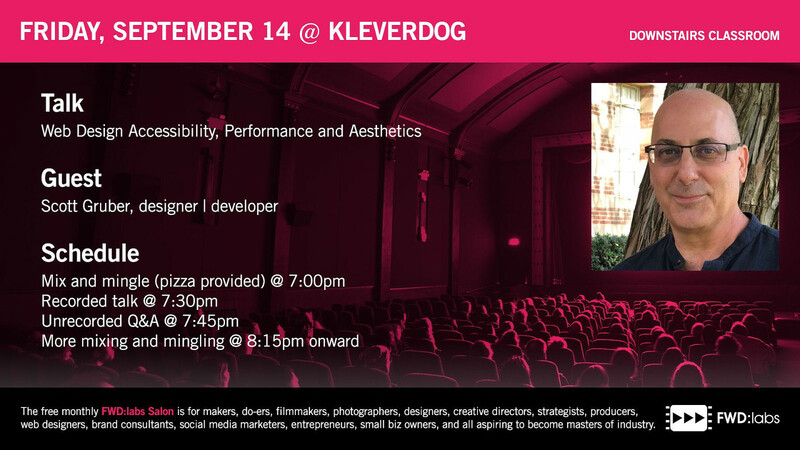 Our next FWD:labs Salon is Friday, September 14th in Los Angeles at @Kleverdog! Our guest speaker is designer | developer @Scott_Gruber giving a talk about web accessibility, performance, and aesthetics!